Altoids are a brand of breath mints. The brand was created by the London-based Smith & Company in the 1780s, and later became part of the Callard & Bowser company in the 19th century. Their advertising slogan is "The Original Celebrated Curiously Strong Mints", referring to the high concentration of peppermint oil used in the original flavour lozenge. Altoids are less widely available in Britain—their country of origin—than in the US to which they are exported. The mints are stocked in Morrisons. Marks & Spencer produces a near identical product called "Curiously Strong Mints". Unlike their marketing in the US, Altoids have never been heavily marketed in the UK. Callard & Bowser-Suchard once manufactured Altoids at a plant in Bridgend, Wales, but has since moved Altoids' production to an existing plant in Chattanooga, Tennessee, United States. This was done to manufacture the products closer to where they are primarily marketed. They were marketed for a brief period in the 1990s under the "Nuttall's" brand when Callard and Bowser was under the ownership of Terry's. Altoids mints are currently[update] available in four flavours: peppermint, wintergreen, spearmint, and cinnamon. "Sugar-Free Smalls", tiny square mints sweetened with sorbitol and sucralose, are also available in peppermint, wintergreen, and cinnamon. In 2007, dark chocolate-dipped mints were introduced in three flavours: peppermint, cinnamon and ginger and in 2008, dark chocolate-dipped mints were introduced in crème de menthe. The chocolate dipped varieties were discontinued in 2010. Also historically made but no longer available were liquorice, cool honey, and (non-chocolate dipped) ginger and crème de menthe varieties. Circa early 2011, Altoids altered the ingredients of their Wintergreen mints, adding blue food colouring. Altoid mints labeled "sugar-free smalls" contain gelatin. Sour hard sweets in round tins were introduced in 2004 but were discontinued in 2010 due to low sales. Flavours included raspberry, citrus, apple, tangerine, and mango. Limited edition passion fruit sours were also released around Valentine's Day in 2005 in a larger 2.3 oz tin instead of the standard 1.76 oz sours tins that had been released up until then. The sugar-free chewing gum, introduced in 2003, was made in the United States. Flavours include peppermint, cinnamon, spearmint, wintergreen and two sour flavours, cherry and apple. The gum has not been seen in stock in US stores since January 2010 and has been discontinued. In 2003, breath strips in peppermint and cinnamon flavours were introduced. They were discontinued and are no longer available. In 2014, Eclipse Mints, another Wrigley product, were rebranded as Altoids Arctic, with the tin remaining identical save for labeling. The rebranded mints were released in only Peppermint, Wintergreen, and Strawberry, doing away with the wider varieties of Eclipse such as Cinnamon, Winterfrost and several other flavors, as well as the chewables. As before, each tin contains 1.2 oz (34g), or about 50 mints. The distinctive tin cases, in which Altoids mints are packaged, are often reused for other purposes. They have long served as containers for household items like paper clips, coins, sewing materials and other small items. The tins are sometimes used to house electronic projects. BeagleBone, a single-board computer made by Texas Instruments, is deliberately shaped with rounded corners to fit inside the tin. The CMoy pocket headphone amplifiers also often use Altoid tins as an enclosure. A Retrocomputing hobbyist computer, the RCA 1802-based Membership Card microcomputer kit, is designed to fit in an Altoids tin. In 2018, Aden Shank even converted an Altoids tin into the smallest-ever functional homemade portable video game system that could play GameCube and Wii games in short sessions. 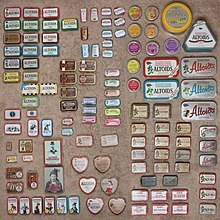 Altoids tins have also been popular with outdoor enthusiasts for many years as first-aid or mini survival kit containers. A name for these kits is Bug-Out Altoids Tins, or BOATs. In Darden Case No. UVA-M-0705 Altoids sales numbers are referenced and compared to Listerine breath strips. In the year 2000 Altoids achieved sales of $107 million and shortly declined to $90 million in sales revenue after only two years. The decline in sales is in part due to the success of PocketPaks breath strips which produced $110 million in sales revenue in less than a year. In 2007 at the grand opening of The New Museum of Contemporary Art Altoids announced the biennial Altoids Award. A cash prize of $25,000 is awarded to four individual artists from around the country. Winners have their art exhibited at the museum after the rigorous selection process is completed. The first winners were chosen by Paul McCarthy, Cindy Sherman, and Rirkrit Tiravanija. ^ Pare, Mike (April 12, 2012). "Life Savers at 100: Wrigley cites Chattanooga plant during celebration". Chattanooga Times Free Press. Retrieved 27 June 2012. ^ "Altoids: Made in America". Prepared Foods Network. September 7, 2005. Retrieved 27 June 2012. ^ Gilbert-Lurie, Mikaela (July 9, 2015). "Why Were Altoids Sours Discontinued? Here's The Sad Truth About The Puckery Candy's Mysterious Disappearance". Retrieved September 18, 2017. ^ "Is Wrigleys (Mars, Inc) killing off the Altoids product and brand?". Adafruit Industries - Makers, hackers, artists, designers and engineers!. Retrieved 8 February 2015. ^ "Altoids FAQ: Are Altoids® tins recyclable?". Altoids.com. 2011. Archived from the original on 2011-07-26. Retrieved 2011-08-08. For over 100 years, Altoids® were packaged in small rectangular cardboard cartons that were approximately the same size as today's recognisable tins. The tins were introduced in the 1920s to help protect the mints and to stay neatly closed in pockets and handbags. ^ "Altoids FAQ: Is there a story behind the Altoids® tin?". Altoids.com. 2011. Archived from the original on 2011-07-26. Retrieved 2011-08-08. The good news about these tins is that they also come in handy as small storage containers for things like nails, coins, paper clips and buttons to name a few – the possibilities are endless. We've even learned that the tins have been used for more curious purposes – as hand-held works of art, even as an emergency wilderness stove. ^ "And here comes the winner… BEAGLEBONE!". Roadside Mysteries. Retrieved 24 May 2016. ^ "Five Best Portable Headphone Amplifiers". Lifehacker. Retrieved 24 May 2016. ^ Hart, Lee. "The 1802 Membership Card Computer". Lee Hart's Homepage. Lee Hart. Retrieved 22 May 2016. ^ Ihnat, Gwen (5 October 2018). "Student makes a playable Wii in an Altoids tin". The Takeout. Retrieved 10 October 2018. ^ "sweeper" (January 11, 2008). "Homemade BOAT (Bug Out Altoids Tin)" (PDF). Outdoors-Magazine.com. Retrieved 2011-08-08. ^ "Altoids - Darden Case No. UVA-M-0705". Grant, Jeremy. "New brands take a toll on Wrigley" Financial Times, London Ed. 26-Oct-2005, pg 27. Terdiman, Daniel. "Altoids, the curiously strong tin; The container stylishly stores battery chargers, iPods and more." New York Times 2-Feb-2005. "Wrigley to buy Altoids and Life Savers from Kraft." Candy Industry ISSN 0745-1032; Volume 169; Issue 11 1-Nov-2004. What's News. The Wall Street Journal, Business and Finance, pg A1. 15-Nov-2004. Pare, Mike. "Wrigley to invest $14M to make Altoids in its Chattanooga, Tenn., plant." Chattanooga Times/Free Press, Knight Ridder/Tribune Business News. 23-Aug-2005.